Swedish-Chilean artist Anton Alvarez has set up camp in the intimate Salon 94 Freemans space transforming it into his studio and injecting it with the kind of action you want to be a part of. It’s hard to categorize Alvarez’s work exactly since it straddles so many different disciplines from furniture, sculpture, painting to installation. One thing it’s not is static; Alvarez’s art practice is as dynamic as it is colorful, and happens to be very interesting to watch. When you enter the brightly lit Freeman space you’ll find yourself in a realm that is both public and private. The gallery assistants are present behind the desk maintaining the space as gallery, but beyond the office area lies the order and chaos of a private studio. The floor is covered in brown craft paper and splattered with paint which has been tracked through the temporary studio to different key locations that hold supplies and work stations. The multi-hued tracks lead you to a colorful cluster of thread spools stacked against a wall, an industrial work table pushed up against another wall, and a chop saw that sits in close proximity to the raw lumber which is leaning neatly in a corner. 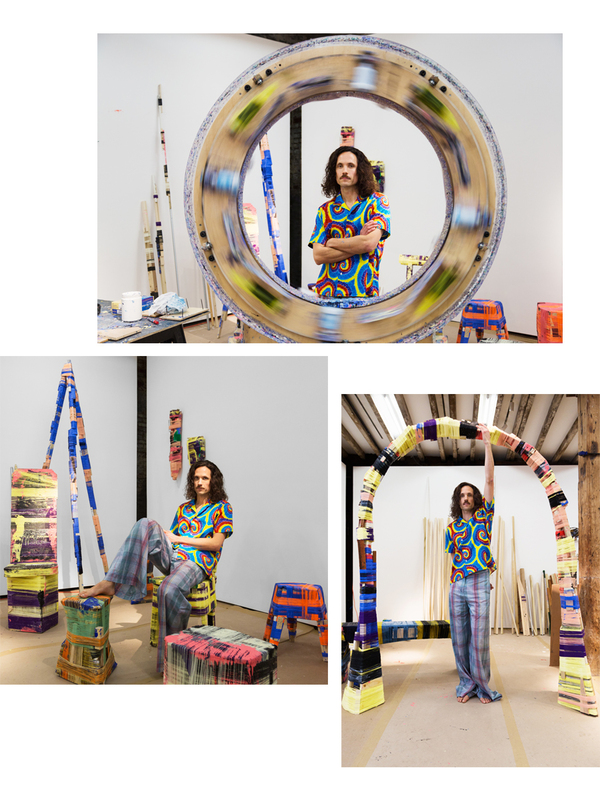 In the center of the room is a strange yet compelling object called The Thread-Wrapping Machine which looks like a fusion between a huge easel and a clunky spinning wheel and appears to be the main event. If you’re lucky Alvarez and his assistant will be working, using his machine to bind pieces of wood, plastic or metal with colorful thread and pigmented glue, transforming raw materials into beautiful structures that are simultaneously paintings, sculptures and furniture. The Thread-Wrapping Machine spins faster than the eye can perceive and casts a web of different colored threads around the raw materials while making a loud whizzing noise. This process of binding things together seems a little magical yet threatening in all the right ways, and without question, dazzling. Enchanted by the combination of disciplines present here, I threw Anton some tie dye and madras plaid and we sat down for a chat. PD: With your education you’ve pretty much covered the full spectrum between art and design. You started with cabinetmaking, moved on to interior architecture and furniture design, and then to design at the Royal College of Art. We often regard these disciplines as separate from one another. Is there a distinction between art, design and architecture for you, or is it all part of the same visual language? AA: At the time for me, on my path of education, I didn’t really know how it would proceed but now I look back and see each step as very much a continuation. Starting with cabinetmaking I was learning how to work with timber and the processes of how to turn it into complex construction but then very much relating to a tradition and a craft that has been around for hundreds of years. Then to interior architecture and furniture design which could be seen as a way to break free from this traditional way of working. Then I studied design at the Royal College of Art which was less pure design orientated and more of an art education, where I had to understand my position in the world of design and art and try to create my own way of working. This project is a collection of all those things. PD: You’ve spent a lot of time investigating different kinds of systems and processes for production. What compelled you to invent new ways of making things? When did you come up with the idea for the The Thread-Wrapping Machine? AA: I think I always had this interest in creating some sort of independence. Also, when I was doing my masters I never intended to be someone who would be employed by a company working for somebody, I wanted to create my own practice in some way. I always had in my mind that I wanted to be free to do what I wanted in my own world. It was as I was thinking those things that this project started to take shape. When it started I didn’t know how it would end, but then it began to go in a direction that I liked, I was starting to create my own tool and my own technique and I could imagine it would give me that freedom. It was in 2010 that I started working on this project and then in 2012 the machine itself was finished and I started spinning. So it was around two years for the development of this technique. PD: The Thread-Wrapping Machine produces a wide variety of beautiful objects, but it is a very compelling object itself. Do you think of the machine as a sculpture? Will you display it along with the objects produced at Salon 94 during the final week of the exhibition? AA: I’m thinking I might not display it. These objects are very much linked to this tool but also when they leave here and go to various places they will exist without the machine. In terms of the machine in regards to how it is constructed and how it looks I spent some time making decisions on how to place the screws, at what angles, at what kind of radius, and all of that which I kind of enjoyed. The machine is well calculated and carefully designed but maybe the outcome of what it created is the complete opposite. I enjoy doing both. PD: When did you realize that there was a performative aspect to making this work? Has publicly producing your work changed your process, ideas or outcome in anyway? AA: I quite quickly understood that there was a performative aspect in this project because it was a machine that has almost this scale of a human being and I’m interacting with another person, the person helping me. We are two people doing something together and it is like a little show when that happens. Also because this is a new way of working people might find it interesting to actually see and become curious about how its made. Then the last week I will take the machine away and people can maybe wonder. I think the objects themselves have a performative aspect as this could be seen as a snapshot in time and then you imagine it being stripped away. PD: You join a mix of wood, plastic, metal, paint and other materials together by thread, and in the case of this exhibition is it true that you are accepting materials brought in by viewers as well? AA: There haven’t been so many people passing by with materials but someone brought a hockey stick which was quite nice and another person brought in some recycled wood. PD: To what extent is the work preconceived and to what extent is it intuitive? AA: I have a plan when I start, the colors are determined and I put them in the machine but then most of the time I make changes along the way. I change the colors of the threads and also like this piece that looks like an antenna, it started off as something else and it’s been kind of half made for a couple of days and then today we finished. Sometimes I feel like something would be better than what I intended in the beginning. Also, I don’t have full control over this process, so then maybe something will go wrong and then that mistake was actually a success. PD: Some articles that discuss your recent work refer to The Thread-Wrapping Machine as futuristic, which I can understand, but to me there is also something strangely dangerous and medieval looking about it, especially when it’s in motion. Has anyone ever been caught in the web of the machine or accidentally been wrapped into one of your sculptures? AA: Sometimes the threads tension can be very stiff and then it can hurt a little bit when you get to your fingers. Once a friend came over to the studio and we did a handshake through the machine on either side and then the threads were wrapping the hands together and then I had to climb through the machine and we were joined. PD: What range of scale are you able to explore with this technology? Are you interested in pushing it further? AA: I’m very interested in that. This technique I first applied to furniture to test it and see if it was strong enough in some way. From the very beginning though the objects were quite abstract when I didn’t know much about the tool and what it could be for. So then I saw the potential out of it and I began to create furniture, given my background in furniture design and cabinet making I guess it was an obvious choice for me to apply it there. But now with this exhibition actually I’m letting more abstract objects come through, like the ones on the walls that don’t yet have a defined function or purpose as these stools do. It’s a very useful thing to help me to understand the process, to let myself do these objects where I’m not sure what they are. Like this long stick here, the object itself I think is quite successful but also it will help me to enrich my knowledge. I also have a parallel path to this project which is to expand it more and create architecture, which the arch is part of that research. AA: I have made another version of the machine which is more suitable for the architectural part of this project. Here mostly we move the objects through the machine, so the weight of the object is the limitation. When the pieces are scaled up and become something larger than we can lift then the machine has to move. In the case of the arch, the machine was moving and the arch was static in the room. The other version of the machine was held on a long arm so that it could actually move up in the air. That machine was good in many ways but not a complete success, so it has to be remade at some point to be more flexible and more adjustable and when that machine is finished I can pursue even further the architectural aspects of this project. AA: I like Y3 very much, they’re very cool.